The Polar bears are large, meat- eating mammals. They are well adapted to their life in the frozen tundra. They are powerful swimmers. They hunt seals and some walruses. They can run in speeds up to 25 mph. 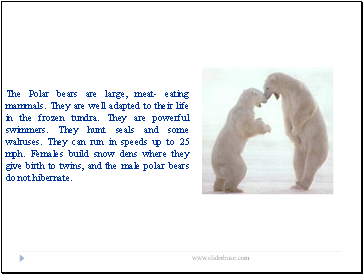 Females build snow dens where they give birth to twins, and the male polar bears do not hibernate. 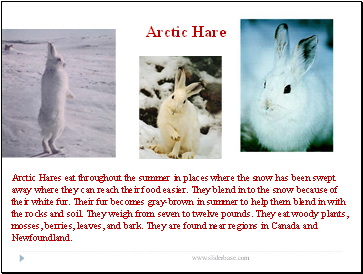 Arctic Hares eat throughout the summer in places where the snow has been swept away where they can reach their food easier. They blend in to the snow because of their white fur. Their fur becomes gray-brown in summer to help them blend in with the rocks and soil. They weigh from seven to twelve pounds. They eat woody plants, mosses, berries, leaves, and bark. They are found near regions in Canada and Newfoundland. 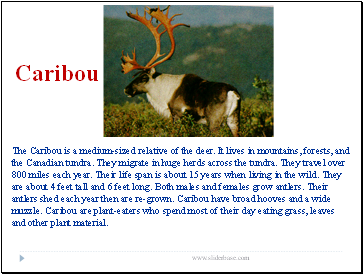 The Caribou is a medium-sized relative of the deer. It lives in mountains, forests, and the Canadian tundra. They migrate in huge herds across the tundra. They travel over 800 miles each year. Their life span is about 15 years when living in the wild. They are about 4 feet tall and 6 feet long. Both males and females grow antlers. Their antlers shed each year then are re-grown. Caribou have broad hooves and a wide muzzle. Caribou are plant-eaters who spend most of their day eating grass, leaves and other plant material. 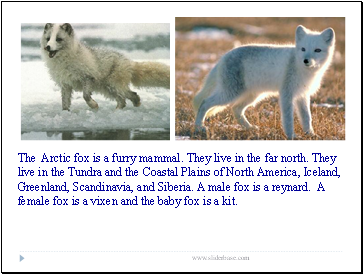 The Arctic fox is a furry mammal. They live in the far north. They live in the Tundra and the Coastal Plains of North America, Iceland, Greenland, Scandinavia, and Siberia. A male fox is a reynard. A female fox is a vixen and the baby fox is a kit. 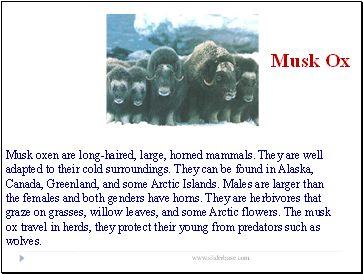 Musk oxen are long-haired, large, horned mammals. They are well adapted to their cold surroundings. They can be found in Alaska, Canada, Greenland, and some Arctic Islands. Males are larger than the females and both genders have horns. 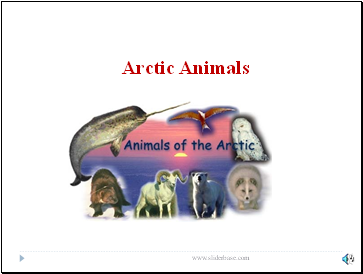 They are herbivores that graze on grasses, willow leaves, and some Arctic flowers. The musk ox travel in herds, they protect their young from predators such as wolves. 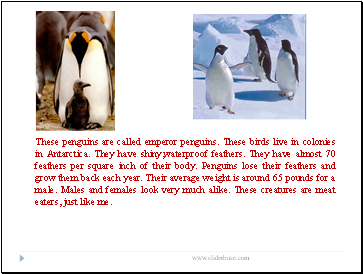 These penguins are called emperor penguins. These birds live in colonies in Antarctica. They have shiny,waterproof feathers. They have almost 70 feathers per square inch of their body. Penguins lose their feathers and grow them back each year. Their average weight is around 65 pounds for a male. Males and females look very much alike. These creatures are meat eaters, just like me.